This week the story is the story of Rosie Revere. She dreams of becoming a great engineer one day. Rosie sees inspiration in everyday things that others see as trash. She crafts her inventions at night alone in her room. She is a shy girl and doesn’t share her inventions with others, she hides them away. One day she gets a visit from her great-great-aunt Rose. Aunt Rose who is Rosie the Riveter shares that she had one unfinished dream; to fly. Rosie knows what her next invention will be! She is going to find a way to make her aunt’s dream come true! When the invention fails to fly Rosie decides she is a failure. Aunt Rose shares a different mindset. The mindset that despite what Rosie thinks about her contraption it is actually a success! She tells her that you can only truly fail, if you quit. She encourages her to keep trying and to not give up! 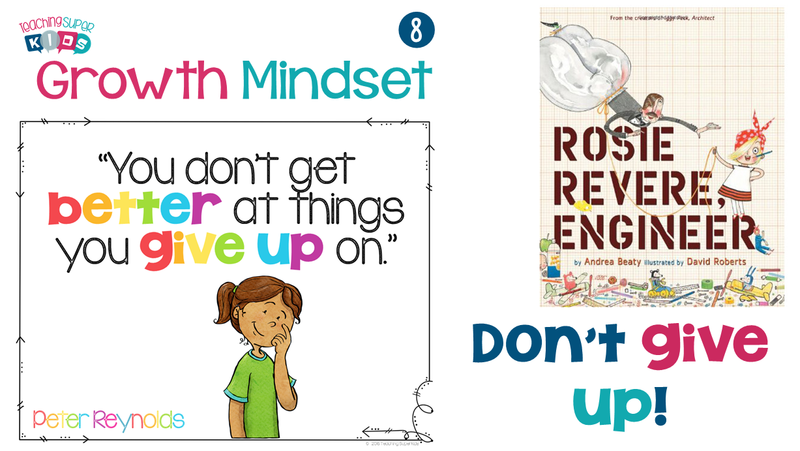 I hope you enjoy this week’s Growth Mindset poster and read aloud! Click here to download your free poster and link to a video.